HOMEOWNER opted for UC verde grass. Thirsty grass. Waterless months. What’s a homeowner to do? Crank open the lawn sprinklers and let the water flow while six percent of California farmland goes idle due to the drought? Keep your regular watering schedule and watch green grass turn chartreuse… then yellow… then ocre? 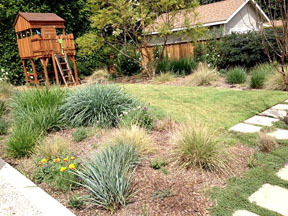 How about a lawn remodel with the city of Los Angeles picking up part of the tab? The Department of Water and Power is encouraging residents to go native by transforming lawns into California-friendly landscape. TURF REMOVAL saves time, money and water. Homeowners can receive $2 for every square foot of green grass replaced with low-water substitutes through the Turf Removal Rebate Program if they apply by a June 30 deadline. This doesn’t mean being bound to 50 shades of brown in your yard. Using DWP’s online “California Friendly Garden Guide,” you can choose from more than 1,500 trees, shrubs, succulents, ground covers and more. The website offers options for specific needs, e.g. select annual + shade + 1-3 inches tall and a photo of the evergreen candytuft appears with the note that there’s a good example growing at the corner of State and Main streets! You can also substitute water-guzzling turf with mulch or permeable pathways like flagstone and decomposed granite. Say goodbye to massive water bills and hello to pomegranates and kangaroo paws. Terrie Owen recently completed her renovation, which included the front yard, parkway and side yard. “I had no idea what I was doing, but I kept looking everything up online,” said Owen who spent about $3,000 on the project and is expecting a rebate check for $1,100. “My last water bill was already lower, and I don’t need weekly mow and blow either.” She estimates she’ll be saving $200 per month. For those who just can’t get the grass monkey off their back, UC Davis developed a drought-tolerant turf for our dry summers. The eponymously named UC Verde is a buffalograss that requires about 12 inches of water per year. That’s 75 percent less than the 48 inches required by Southern California’s most popular grass, Fescue. Considering that LA water rates went from $3.96 per hundred cubic feet to $4.68 this year, it takes a lot of greenbacks to keep your green on. Larchmont resident Sarah Bynum was inspired to create a drought-tolerant landscape after touring the Water Conservation Garden at Cuyamaca College. 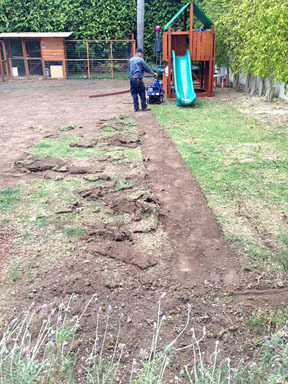 She installed UC Verde grass last year. Mowing is optional with UC Verde. You won’t see a rebate for UC Verde or turf-like grass, but you can switch out your overhead sprinklers to rotators and get a rebate of $8 per sprinkler head. Instead of replacing that vinyl floor, remodel that lawn.